shadows cast on past lives. the knot at the back of his head. the new bride poised with scissors. 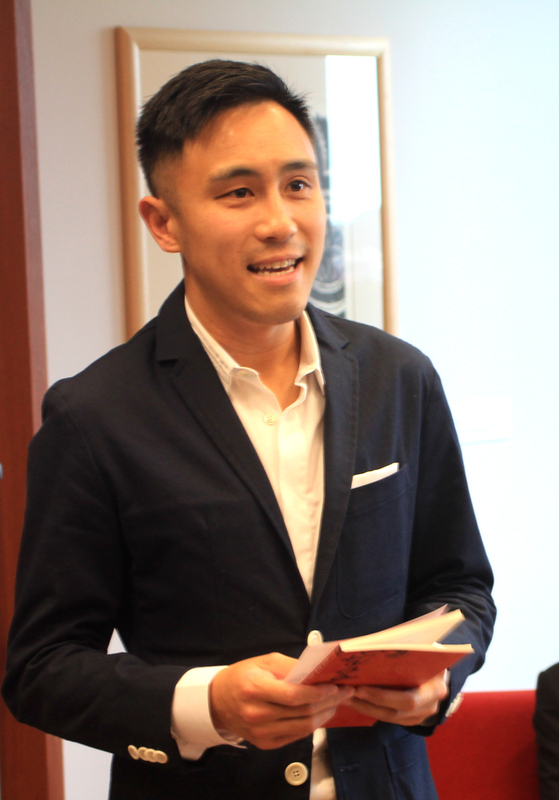 Chris Tse is a Wellington poet and one of three authors of the joint publication AUP New Poets 4 (Auckland University Press). Chris’ collection in the book, Sing Joe, is centred around family stories concerning his great grandfather’s migration to New Zealand from China, and his great grandmother who was left behind. The poem above gives us one peek into this story. You’ll need to read Sing Joe in its entirety to find out the rest – and it’s well worth the read. As well as writing, Chris is an editor, actor, musician and occasional filmmaker. He studied English literature and film at Victoria University where he also completed an MA in Creative Writing. In 2009, he won the NZ Chinese Association/Listener short story competition. The Tuesday Poem bloggers are celebrating our first birthday this week (thanks to the tireless efforts of Mary McCallum), by writing a collaborative poem. You can watch it unfold by clicking on the quill above. What a lovely poem – light as a leaf in structure, but such a telling last line. I have the AUP New Poets 4 to read: I’m looking forward to it. I’m not sure why but this poem is terrifying, how can such light words be so scary?